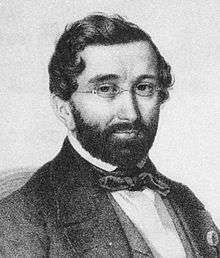 Adolphe Charles Adam (French: [adolf adɑ̃]; 24 July 1803 – 3 May 1856) was a French composer and music critic. A prolific composer of operas and ballets, he is best known today for his ballets Giselle (1841) and Le corsaire (1856, his last work), his operas Le postillon de Lonjumeau (1836), Le toréador (1849) and Si j'étais roi (1852) [n 1] and his Christmas carol Minuit, chrétiens! (1844), later set to different English lyrics and widely sung as "O Holy Night" (1847). Adam was a noted teacher, who taught Delibes[n 2] and other influential composers. Adolphe Adam was born in Paris, to Jean-Louis Adam (1758–1848), who was a prominent Alsatian composer, as well a professor at the Paris Conservatoire. His mother was the daughter of a physician. As a child, Adolphe Adam preferred to improvise music on his own rather than study music seriously and occasionally truanted with writer Eugène Sue who was also something of a dunce in early years. Jean-Louis Adam was a pianist and teacher but was firmly set against the idea of his son following in his footsteps. Adam was determined, however, and studied and composed secretly under the tutelage of his older friend Ferdinand Hérold, a popular composer of the day. When Adam was 17, his father relented, and he was permitted to study at the Paris Conservatoire—but only after he promised that he would learn music only as an amusement, not as a career. He entered the Paris Conservatoire in 1821, where he studied organ and harmonium under the celebrated opera composer François-Adrien Boieldieu. Adam also played the timpani in the orchestra of the Conservatoire; however, he did not win the Prix de Rome and his father did not encourage him to pursue a music career, as he won second prize. Adam is probably best remembered for the ballet Giselle (1841). He wrote several other ballets and 39 operas, including Le postillon de Lonjumeau (1836) and Si j'étais roi (1852). His Christmas carol "Cantique de Noël", translated to English as "O Holy Night", is an international favorite, and is said to have been the second piece of music to be broadcast on radio. "Cantique de Noel" is based on a poem written by M. Cappeau de Roquemaure. Adam subsequently crafted a melody for the tune that was translated into English by John Sullivan Dwight (1813 - 1893), a Boston music teacher and music journalist, as well as co-founder of The Harvard Music Society. List of ballets by Adolphe Adam. ↑ Si j'étais roi, particularly in France is often regarded as his finest work. ↑ Delibes is widely known in the English speaking world for writing The Flower Duet, Lakmé, Coppélia and Sylvia. 1 2 Randel, Don Michael, ed. (1996). "Adam, Adolphe (Charles)". The Harvard biographical dictionary of music. Cambridge, Mass. : Belknap Press of Harvard Univ. Press. ISBN 0-674-37299-9. ↑ "Adolphe Adam | Biography, Albums, Streaming Links". AllMusic. Retrieved 2016-11-21. ↑ "Orange". Anao.pagesperso-orange.fr. Retrieved 2016-11-21. ↑ "Builder of Tomorrows: First Broadcast extract". Earlyradiohistory.us. Retrieved 2016-11-21. ↑ Cyber Hymnal Archived 5 November 2011 at the Wayback Machine. ↑ Richliano, James (2002). "O Holy Night". Angels We Have Heard: The Christmas Song Stories. Chatham, New York: Star Of Bethlehem Books. ISBN 0-9718810-0-6. Wikimedia Commons has media related to Adolphe Adam.